Working in culinary environments can be exciting, but there are often a wide range of hazards in this fast-paced industry. This includes handling warm plates, which are often too hot to touch with your bare hands. The Shield GI/WPG Nylon Warm Plate Gloves are designed with rubber dots on the palms that protect you against contact heat and help you maintain a secure grip on the plates. 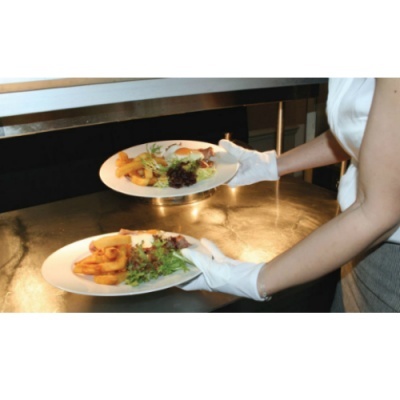 The Warm Plate Gloves are designated Category I gloves, meaning that they should be suitable for minimal-risk tasks. This makes them ideal for warm plate handling in settings that don't include other hazards. The Shield Nylon Warm Plate Gloves are available in one size. As a result of their 100% nylon construction, the gloves can be stretched to suit most users. This design provides you with a better fit and an improved level of comfort. Please see the table below for more information.